Physician Bill West, right, examines a patient’s foot with assistance from interpreter Loandra Yanzapanta, left, on Wednesday at HealthNet’s clinic in downtown Janesville. Mark Karrels looks at a photo of a man named Tom every time he opens his wallet. Tom was missing nearly every other tooth when Karrels met him years ago at HealthNet of Rock County’s dental clinic. “I took a before and after picture to remind me a simple act of me taking a couple hours to fabricate this partial denture changed this guy’s life,” said Karrels, a dentist. Volunteers such as Karrels have guided every innovation at the free and charitable health clinic over its 25-year history, said Ian Hedges, CEO of HealthNet. Dentist Mark Karrels consults with HealthNet patient Nancy Wells of Janesville, who was getting her first checkup in three years Nov. 15, 2006. HealthNet offered some dental services before officially opening a clinic in 2007. 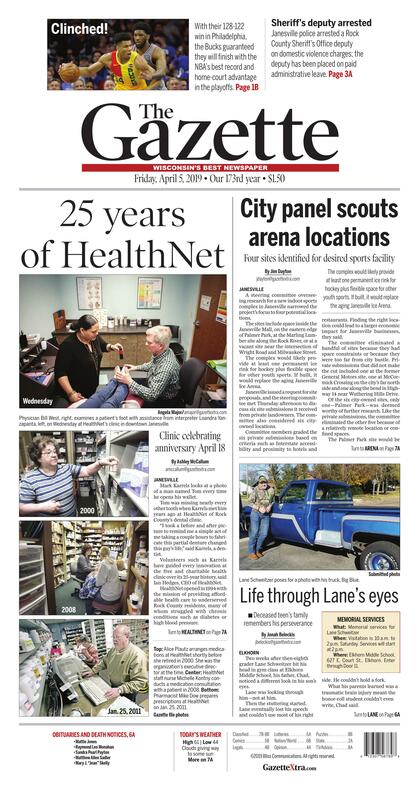 HealthNet opened in 1994 with the mission of providing affordable health care to underserved Rock County residents, many of whom struggled with chronic conditions such as diabetes or high blood pressure. HealthNet will celebrate its 25th anniversary with a free event Thursday, April 18, at the Armory in Janesville. Organizers will talk about the nonprofit’s past successes and what the future holds, Hedges said. As Hedges and others researched HealthNet’s history, one theme stood out: Everything begins and ends with volunteers, said Heidi Van Kirk, development director at HealthNet. Staff and volunteers have made a timeline out of photos, Post-it notes, newspaper clippings and documents that piece together the stories behind HealthNet. The timeline begins with Alice Plautz, a nurse anesthetist in the Vietnam War who was named the 1992 Vietnam Veteran of the Year by the state chapter of the Vietnam Veterans of America, said Teresa Nguyen, a history teller with the Rock County Historical Society. This photo from The Gazette's files shows HealthNet Executive Director Alice Plautz shortly before she retired in 2000. It continues with the efforts of countless others who believed in the importance of affordable health care. Hedges called Mike Dow the “bedazzler” of HealthNet. The retired pharmacist upgraded the clinic’s medicine room in the early 2000s by expanding its offerings, organizing it and installing the same software pharmacists use in pharmacies. Because of overcrowding, HealthNet staff nurse Michelle Kontny had to conduct a medication consultation with a patient in a medicine dispensation area in 2008. Getting the medication room—which is not technically a pharmacy—onto the same systems pharmacists use helped operations run more smoothly because HealthNet’s volunteer pharmacists could transition seamlessly between pharmacies and the clinic, Dow said. In this photo from Jan. 25, 2011, pharmacist Mike Dow prepares prescriptions with members of the nursing staff at HealthNet in Janesville. When HealthNet officially opened its dental clinic in 2007, Karrels led the charge. He was a catalyst for the new dental office because he donated equipment that he was replacing in his own dental office. Other dentists also helped, offering funds and manpower, Karrels said. In this Dec. 19, 2016, photo, dentist Zach Gregerson works in a patient's mouth at HealthNet's dental clinic in Janesville. “I am pleased we have maintained the dental part. It has been a big focus and makes immediate impact on people’s lives,” he said. After Karrels fixed his smile, Tom finally had enough confidence to talk to new people and interview for jobs. HealthNet’s volunteer dentists often see people with problems similar to Tom’s. Having access to quality oral care has improved their health, Karrels said. Mark Flottum served on HealthNet’s Board of Directors from 2008 to 2016. His career has included a variety of jobs in vocational rehabilitation, Rock County’s probation system and at CESA 2, which offers development and educational services to school districts. He now teaches parenting classes to inmates at the Rock County Jail. Flottum has offered insight from his career to help HealthNet improve its services, Hedges said. Physician Bill West speaks to a patient Wednesday at HealthNet in downtown Janesville. The nonprofit offers free and affordable health care to underserved Rock County residents. It is celebrating its 25th anniversary this year. In the last couple of years, HealthNet has started offering mental health screenings with all patient visits, he said. Behavioral health services are at the center of the organization’s annual conference, which Gwen Hazekamp started three years ago as a volunteer, Hedges said. Hazekamp, who is the current board president, said starting the conference and working on the organization’s strategic plan are among the most exciting things she has done at HealthNet. The clinic has been tight on space for years and has wanted to combine its health and dental clinics under one roof to increase efficiency. That’s why the donation of Blackhawk Community Credit Union’s administrative building as HealthNet’s future clinic was such a “wonderful gift,” Hazekamp said. Blackhawk Community Credit Union intends to donate its administrative building at 2707 Kennedy Road to HealthNet of Rock County. But with that gift comes a lot of planning, which will be a main focus for the board in the years to come, she said. “Every big step has been a big idea from volunteers,” Hedges said. What: HealthNet of Rock County's 25th anniversary celebration. Staff and board members will look back on the history of HealthNet and discuss its future. When: 6:30-8:30 p.m. Thursday, April 18. Where: The Armory, 10 S. High St., Janesville. For more information: Call 608-756-4638. A steering committee overseeing research for a new indoor sports complex in Janesville narrowed the project’s focus to four potential locations. The sites include space inside the Janesville Mall, on the eastern edge of Palmer Park, at the Marling Lumber site along the Rock River, or at a vacant site near the intersection of Wright Road and Milwaukee Street. The complex would likely provide at least one permanent ice rink for hockey plus flexible space for other youth sports. If built, it would replace the aging Janesville Ice Arena. Janesville issued a request for site proposals, and the steering committee met Thursday afternoon to discuss six site submissions it received from private landowners. The committee also considered six city-owned locations. Committee members graded the six private submissions based on criteria such as Interstate accessibility and proximity to hotels and restaurants. Finding the right location could lead to a larger economic impact for Janesville businesses, they said. The committee eliminated a handful of sites because they had space constraints or because they were too far from city bustle. Private submissions that did not make the cut included one at the former General Motors site, one at McCormick Crossing on the city’s far north side and one along the bend in Highway 14 near Wuthering Hills Drive. Of the six city-owned sites, only one—Palmer Park—was deemed worthy of further research. Like the private submissions, the committee eliminated the other five because of a relatively remote location or confined spaces. The Palmer Park site would be on the park’s eastern edge, near an Interstate 90/39 overpass. There would be no acquisition cost. The Marling Lumber site, which would also make use of some city-owned parcels along the river, has an asking price of $1.1 million. The site at Wright and Milwaukee would cost $1.25 million, Neighborhood and Community Services Director Jennifer Petruzzello said. RockStep Capital, which owns the mall, has an initial asking price of $4 million. The committee liked the mall’s location but balked at the cost. Financing the sports complex will require public and private money. Petruzzello said the committee does not have a cost estimate for the facility because it will depend on location and design. The parks and recreation committee will discuss the steering committee’s findings next week. The city council will then consider authorizing money for design plans April 22, she said. The city would then settle on a location before design work would begin. Petruzzello said determining financing is the next big challenge after weeks of research. She was optimistic the project would get done, citing a January survey that showed support from residents. That could lead to private donations. Lane Schweitzer poses for a photo with his truck, Big Blue. Two weeks after then-eighth grader Lane Schweitzer hit his head in gym class at Elkhorn Middle School, his father, Chad, noticed a different look in his son’s eyes. Lane was looking through him—not at him. Then the stuttering started. Lane eventually lost his speech and couldn’t use most of his right side. He couldn’t hold a fork. What his parents learned was a traumatic brain injury meant the honor-roll student couldn’t even write, Chad said. Lane’s mother, Judy, said the Elkhorn teenager didn’t know who his own family was. “There’s a lot of nights I walked through the woods because who knows?” Chad said. “I mean, I didn’t know if he was coming out of it—if he was going to live with us for the rest of his life. “It was a long, long, long, long year,” he said. But with a Herculean effort from Lane, his family and other support systems, Lane made a near-complete recovery. He was doing well in school again, Judy said of the Elkhorn Area High School sophomore. Judy thought Lane’s recovery would be the most difficult task she would have as a parent. But Judy’s baby, the boy who always shook the hands of military members he saw, the tall teenager who could always make you laugh, on March 27 died after his Yamaha dirt bike collided with a Ford Expedition near W7889 Reliance Road in the town of Whitewater. Sitting on the side of the road, Judy wanted Lane’s body moved away from the crash. She wanted to hold her son’s hand. The medical examiner asked her if she wanted Lane to be an organ donor, and Judy said no. Nobody would touch her baby, she said. “I said, ‘Lane’s always willing to help somebody,’” Chad said. From left, Chad, Cheyenne, Judy and Lane Schweitzer in a family photo. Judy knew they needed somewhere big for this Saturday’s memorial services—her son touched a lot of lives, she said. They couldn’t do it at the high school because Lane’s friends and his sister, Cheyenne, have to go back there every day. The family picked the Elkhorn Middle School—where she said Lane and his family’s lives changed forever—to bring it all full circle, she said. The school district offered anything they needed, so they went with it. Superintendent Jason Tadlock said Lane was a “really kind individual” who was well-liked by students and staff. Julia Bikowski, also a sophomore in Elkhorn, said Lane—the friend who would always wait at her locker, who would spray his cologne on her as a joke—was a “really caring person” who always asked his friends about their day. Lane and Julia met in third grade through 4-H.
Lane showed sheep, and the money he made went into his savings—except when Lane really wanted a truck. Using his own money, Lane bought “Big Blue,” a 1987 Chevy with an 8-foot stepside box that made him so proud. “We hit so many car shows last year,” Judy said. After Saturday’s services, Lane’s obituary says he will take his final ride in “Big Blue,” the truck that made any day a good day as long as he got to ride in it. Lane was a hard worker. While other kids his age were going on rides at the county fair, Chad said his son insisted on working at the tent for a La Grange church. Chad said Lane wanted to go into the Marines but couldn’t after his brain injury. Lane worked at an Elkhorn dairy farm on Saturday mornings, starting at 4:30 a.m.
Judy and Chad would get texts from Lane on those mornings. They would be pictures of the sunrises he saw while many of his classmates had their eyes shut, fast asleep. Now, Lane is gone, and his last ride will be Saturday. But through his donated organs, Chad knows Lane helped others just like he used to. Chad hopes to meet those people one day. Someone out there has Lane’s eyes, the same ones that looked at his mom and dad when he was recovering in the hospital and couldn’t speak or move. The same eyes that saw the Saturday morning sunrise. “I hope everybody comes forward to us in a year when they can,” Chad said. Lane Schweitzer, right, with his sister, Cheyenne Schweitzer. When: Visitation is 10 a.m. to 2 p.m. Saturday. Services will start at 2 p.m.
Where: Elkhorn Middle School, 627 E. Court St., Elkhorn. Enter through Door 11.